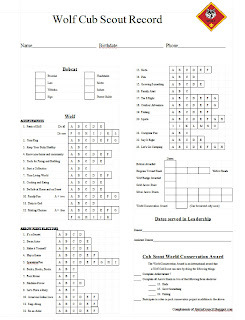 Above is a tracking sheet to be able to keep track of where each boy is on requirements towards the Bobcat, Wolf, Wolf Arrow Points, Progress Towards Rank beads, Gold and Silver Arrow Points, and Cub Scout World Conservation Award. There is also a spot to track the dates they served as Denner or Assistant Denner. I like to print this tracking sheet on cardstock, and I print one for each boy to be kept in my leader binder next to their tracking sheet for Bear, Webelos, Belt Loops, and Religious Award. I keep a different tab for every boy with all 3 tracking sheets. Then I have information on each boy. It helps to do it this way if you do one requirement one week and a different one other weeks. Not every boy is there every week. By doing this, I can always know where each boy is at, and it is all in one place. I keep a roll, and next to the roll I write down what we did that week. If the parents ever have questions, I always have a place to look back at on the roll, and I can always copy the tracking sheet to show them where their boy is. This tracking sheet is for the old program. Need tracking sheets for the NEW Program? We have them ready for you! LINKS FOR THE NEW TRACKING SHEETS ARE BELOW. Do you have one of these for Tigers? I really like this blog! Thanks Becka, I really appreciate that. Unfortunately, I have never worked with Tiger Cubs, so I don't have a form made up for that. I have done everything else and am getting ready to add one for Webelos. If there is anyone out there that has a form for Tigers, please respond and let me know!! Are you still needing a tracking page for the Tigers? Thank you Kelly for donating a Tiger tracking sheet! Check out our blog for the new Tiger tracker. I just became the cubmaster, with a new CC and wolf DL. I used to use CubTrax excel spreadsheets as a DL myself, but could not download eith the wolf or Bear files anymore. I found this and printed out a master of all four dens and one for all the boys of my pack. I think this is greener since I can keep one folder with my whole packs advancement and not have to print a new one every month for the parents. I've e-mailed them to my DL's as well and if they keep me updated (I'm also functioning as advancement chair right now) I can keep them focused more on their curriculum and I'll worry about their progress. Thank you for having this available.